There is a real risk that the African swine fever virus could enter Canada — and if it did, it would be catastrophic, says one of the country’s leading swine health experts. “If Canada got a single case in our country, our borders would close to all nations,” said Dr. Egan Brockhoff, a partner in Prairie Swine Health Services in Red Deer and veterinary counsellor for the Canadian Pork Council. The virulent disease, which is harmless to humans but deadly for pigs, has swept through China but is also widely present in Eastern European farms, where 1,000 new cases were found in the four months before Christmas. Western Europe is also under threat after a wild boar in Belgium tested positive in the fall — prompting France to recently order army personnel to assist hunters in efforts to cull boars near its border. But oceans are no protection and there is a substantial risk the virus could arrive in North America either through contaminated feed or pork products being illegally brought from overseas. The latter is common, said Brockhoff, who has worked extensively as a swine veterinarian in China and five other Asian countries. 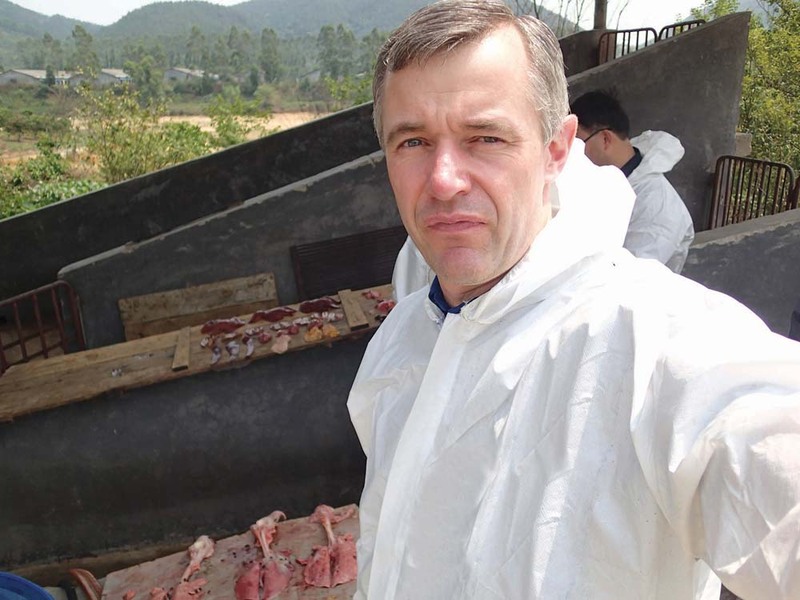 Brockhoff was in China late last year, working with officials dealing with the African swine fever outbreak and seeing the effects first hand. Although authorities have put prominent warnings in airports telling travellers not to take uncooked pork products (cured, salted, or smoked meat) on their trips, many do just that. “Taiwan, Korea, and Australia have already reported finding virus in products they’ve seized at their airline borders,” he said. Canada and the U.S. don’t test for the virus, but are finding (and destroying) pork products at airports. “We have sniffer dogs at the border, we’re doing inspections,” said Brockhoff. However, the virus is easily spread, including via contaminated transports and on people’s footwear. These red spots are typical of African swine fever. This infected pig was part of a cull in south China late last year. That’s the other major risk as the Canadian pork sector imports a lot of soy-based feed ingredients from China. “Those products are great at moving the virus,” he said. “(But) this isn’t just a China problem. This is a global problem. The Canadian Pork Council is working with the Canadian Food Inspection Agency to minimize that threat. Complicating the situation is that while commercial pork producers have extensive biosecurity protocols, that’s not necessarily the case for small herds (so-called ‘backyard pigs’). And wild pigs are also a threat. No one knows how many wild boars are in Alberta, but Brockhoff visited a pig farm (located between Calgary and Red Deer) last month, where the owners reported shooting a wild boar. Wild pigs are proficient breeders that reach sexual maturity at a young age and will seek out backyard pigs, and may be attracted to properties housing commercial hog operations. There is no vaccine, treatment, or cure for African swine fever, and until recently there were no major efforts to create a vaccine. However, traditional techniques for producing a vaccine have, so far, been unsuccessful and may require a new approach, he added. 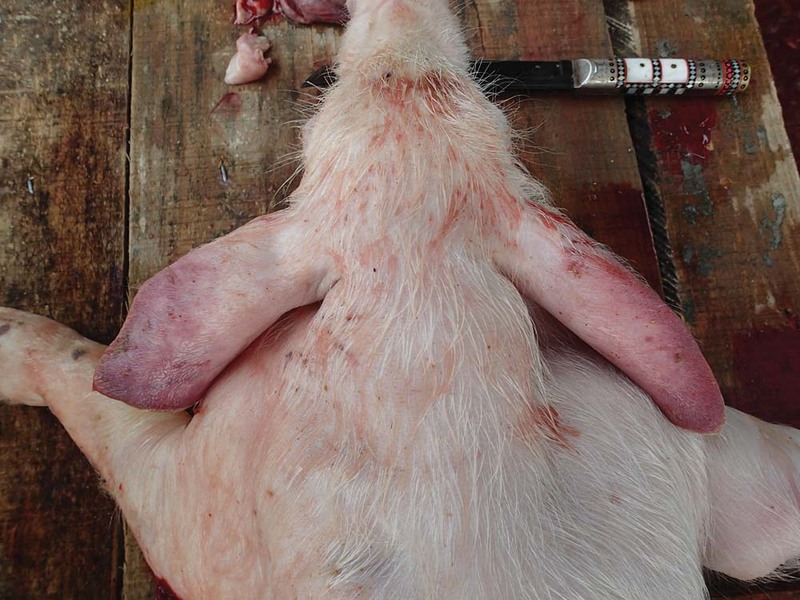 The symptoms of African swine fever can be very similar to classical swine fever. Pigs may have red spots or patches on their skin, will often cough or appear anorexic, listless, and depressed. Dead pigs have evidence of internal bleeding and mortality rates for the acute version of the disease can be up to 100 per cent. Since the first case in China was discovered in August, the disease has spread to 24 provinces and led to the culling of more than 900,000 pigs. Some estimate the nation’s pig herd could fall by 20 per cent in 2019. But the situation could even be worse in Canada as 70 per cent of the sector’s production is exported. “People recognize that this is a clear risk and in general, everyone wants to see the pork sector rally around making sure that this doesn’t enter Canada,” said Brockhoff.